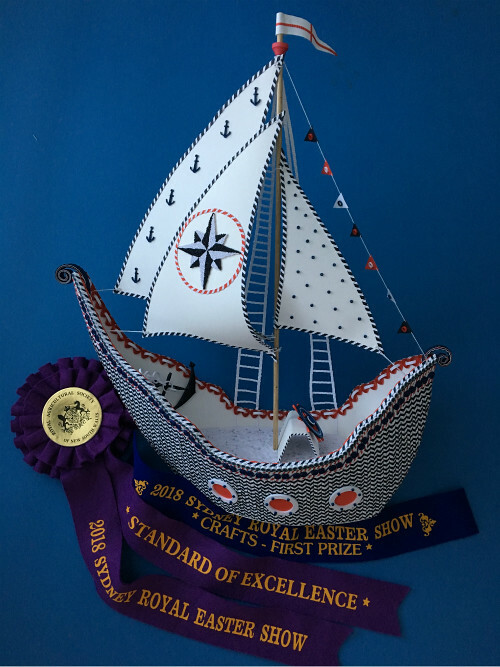 The annual Sydney Royal Easter Show took place in late March through early April this year, and once again my Aussie friend, Licia Politis of New South Wales, created a paper art project that took top honors in the quilling category. 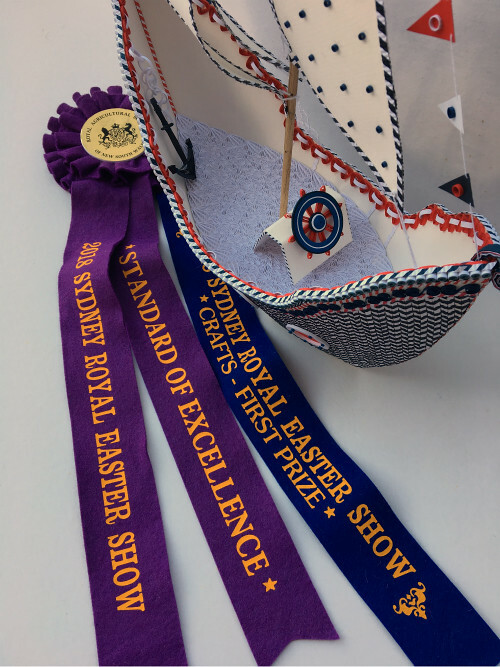 Sea Quill was awarded a first prize and was displayed in the Standard of Excellence Showcase. 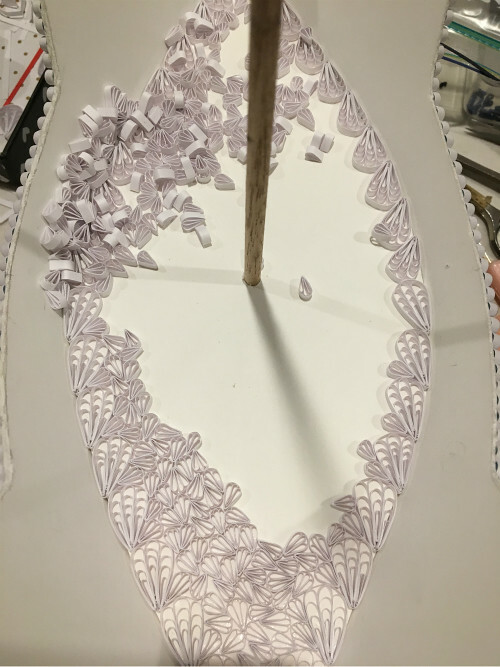 I'll never fully understand how Licia is able to design and create such an incredibly detailed project in just several weeks before the show, but she obviously works well under pressure! 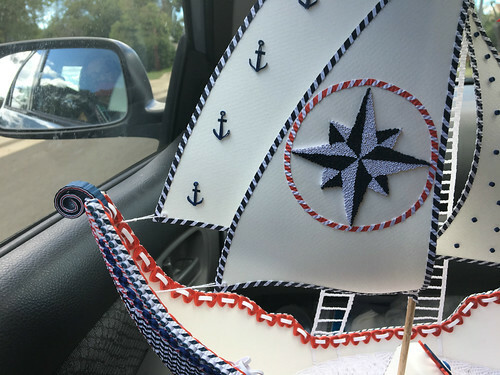 Each year I delight in her emails in which she updates me on her progress, and then there is a photo to look forward to that she snaps at the last moment... here is Sea Quill on the way to its temporary mooring at the Easter Show Arts and Crafts Pavilion. 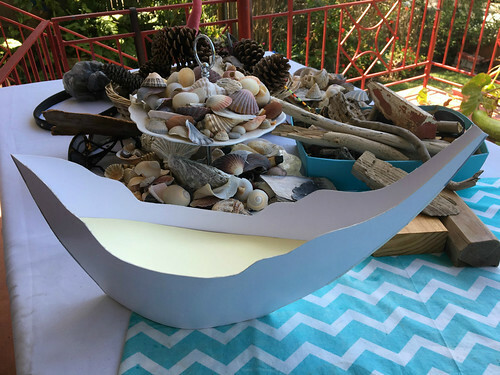 I asked Licia to tell us about her inspiration for creating Sea Quill, its construction process, and even how the name was chosen. I am definitely not a sea, water, or boat person as I love feeling the earth below my feet; watercraft is something I knew very little about. I began by researching styles of boats/ships, which I enjoyed immensely. I was absolutely amazed at the variety of shapes above and below the waterline, as well as sails. I became more attuned with the different parts of sailing vessels. I started to design a shape with the idea of a fantasy style, not a replica. Creating the base shape was easy at first; however, quilling the outside wasn't! The surface is covered with crimped bandaging and bordered by filigree S scrolls and tight coils. Not being a paper engineer, I found the construction of the boat to be very tricky. The quilling was also a challenge... I wanted to use as many techniques as possible, as one does in a competition. Then came the sails - style and placement were important. 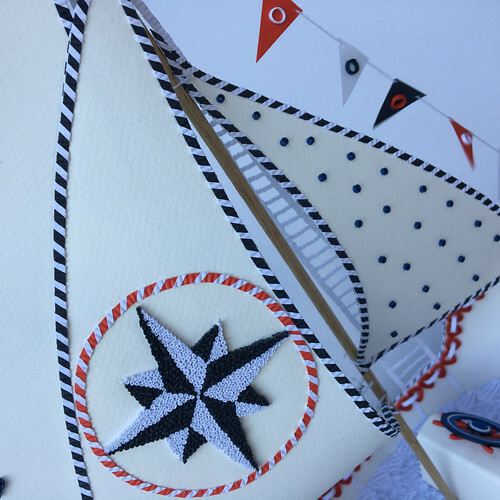 I wanted to create slightly curved sails to give the effect of motion. 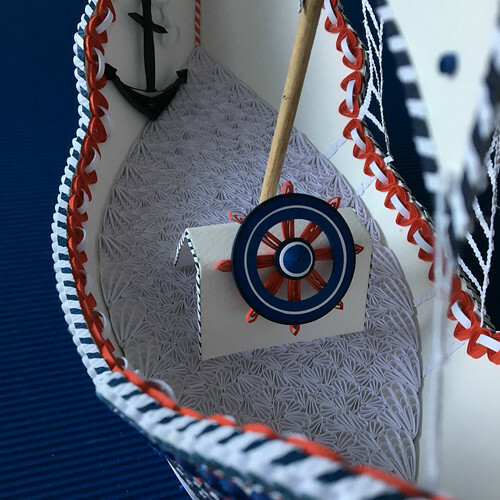 Nautical motifs of the sailor's star/compass, anchors big and small, rope, chains, shells, ladders, and a ship's wheel featured throughout the piece. 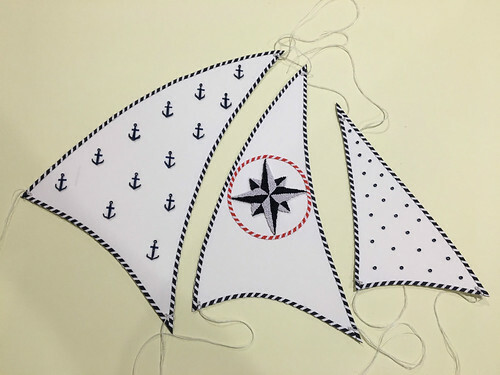 This image shows the sailor's star in progress. 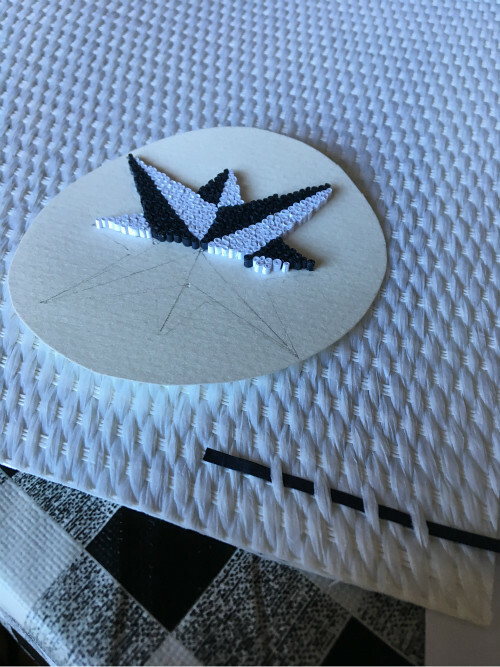 At first, Licia planned to place it on a piece of Japanese specialty paper and experimented with threading a quilling strip through the textured weave... just one example of many trials discarded in a project of this scope. 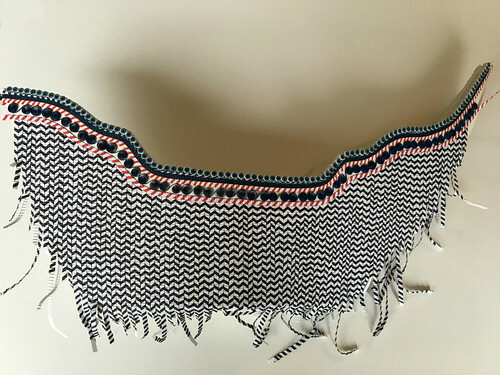 I was so pleased to be able to incorporate the Vortex Coil (a technique originated by Licia) on the top inside edge of the base, as well as ring coils, bandaging, crimping, tight coils, loose coils, dimensional tight coils, alternate side looping, wheatears, and filigree shapes. After considerable deliberation in choosing a name for the ship, a play on the word sequel, a suggestion from a nephew, seemed just right. And so the ship has been christened Sea Quill. 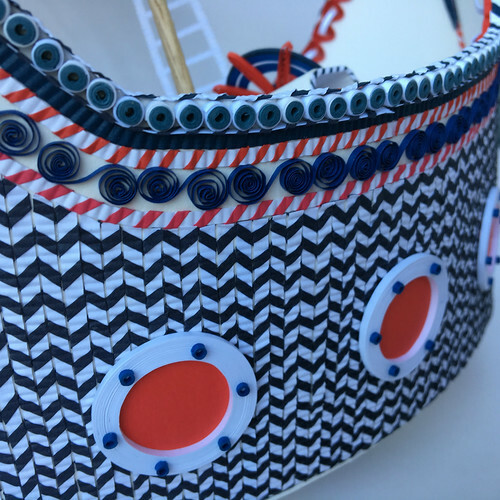 Several previous winning entries by Licia Politis include Day at the Races, Fruitful and Australian Chess Set, If the Shoe Fits, Wear It, and Tea Set. I know, right?! Licia amazes me. Totally incon”sea”vable! It totally looks like fabric until you see the details.....Love it! Mind blowing detail that just begged for zooming in for confirmation that it really was paper! Amazing work Licia! Thanks for sharing Ann! Licia's work is so precise. I love how she covered the floor of the boat with alternate loops !! I am a fan. So glad you enjoyed seeing Licia's photos, Cecelia and Suganthi! I'm a fan too.